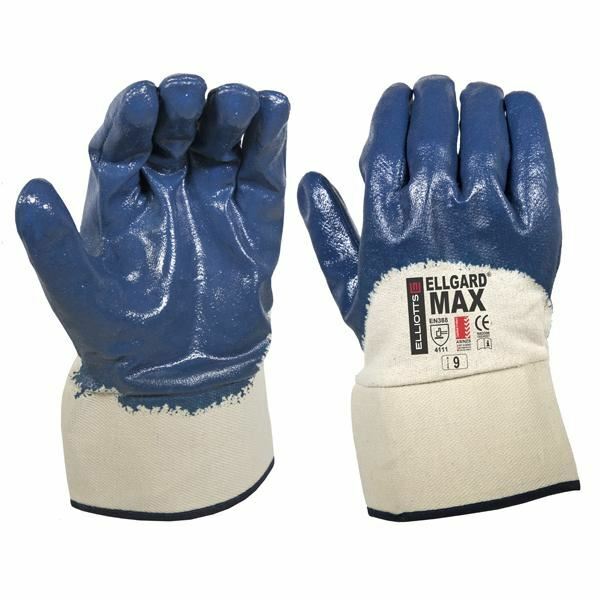 ELLGARD®Max features tough heavy duty blue nitrile coating, while also maintain outstanding fit and dexterity - the glove moulds to the contours of the hand. Certified by SAI Global to AS/NZS 2161.3:2005 Occupational protective gloves - Protection against mechanical risks. Performance AS/NZS 2161.3/ EN388 - 4111. Ideal for applications in industries such as building, brewing, forestry, railways, metal fabrications, automotive assembly, and plastics processing. Ideal for handling abrasive materials such as castings, cores, extrusions, tubular steel, barbed wire, sheet metal, timber, plywood, concrete blocks, bricks, and tiles.